Finished my edits this week. 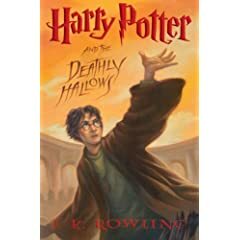 Finished Harry Potter and the Deathly Hallows yesterday. I know there are folks out there who (like me) didn't read it immediately, and don't want to post any spoilers. And if you don't already have it stashed on top of your TBR pile, you really should go Buy It Now. Yes, I have succumbed to Pottermania. I wasn't going to. I figured I'd pop down to the bookstore sometime this weekend and pick up a copy, probably after I finished my edits on the latest ms. I'd treat myself to a big ole reading marathon with my buddy Harry as soon as I got the edits done and off to my editor. Then I started noticing all the brouhaha on the web. Rumors were flying about the end of the book. People were posting that they knew the secret, if anyone wanted a hint off-list. And the parties that were being planned! Yikes! So I was starting to get worried. What if, by the time I finished my revisions (Note to Angie: Almost there! Honest! ), everyone was sold out? What if someone let it slip in my presence before I had a chance to get my own copy? Obviously, my tactics needed a change. So I started searching around the area for midnight releases. Understand, I live in a fairly small town. There's just one bookstore, an independent, and Wal-Mart. Both, as it turned out, were planning Potter Parties for tonight. I considered the independent store's party, but once the article in the paper appeared last night saying that almost all of their preordered books were spoken for, I turned to Wal-Mart. I could pick up a wristband at 8 pm, head home for a couple of hours of writing time (Note to Angie: Which I used! I'm on the downward slope! ), then come back to pick it up at midnight. I got there at 8, surprised to find no line. I walked right up and got a red wristband (Gryffindor, first house to get books at midnight) and headed home, mumbling about how people in my town had no respect for reading. I had to take it all back, though, when I got there at a little before midnight. They were almost completely out of yellow wristbands (Hufflepuff, last house), and the waiting line snaked all the way around the store to the paint department. Hundreds of people, all waiting for a chance to buy and read the last Harry Potter book. So now I've got the book, calling my name. But I can't even crack it until I finish my revisions and turn them in (Note to Angie: which will be soon!). It's an incentive, sure, but the problem still remains -- what to do about spoilers? A girl in front of me in the checkout line read the last page even before she bought the book. The rest of us threatened her with bodily harm if she so much as breathed a word. Yes, I promise, it's my last Disney-related post for a while. I just couldn't resist spending my TT this week on the trip! 1. Do your early admission day first. Since we had multi-day parkhopper tickets, we had one early admission day. We chose to use it on our first day, and it was the best decision of the trip. Later on in the week, we would have been too wiped out to get moving early enough. Do it right away, while you're still fresh. 2. It pays to get up early. On our early admission day, we were up, dressed, and out the door before six a.m. With three children. It was brutal, but so worth it. We were the second family in line at the bag check, first in our particular line to get in, and ended up being chosen as the family to "open" Disneyland. Basically, we got to go in first, do a countdown, and wear "Honorary Disneyland Citizen" buttons all day. 3. If the gates open at eight, be there by 7:20. The lines will already be crazy. 4. Do Finding Nemo first thing, or not at all. It's a cute ride, and the younger kids loved it, but there's no way I would have stood in line for two-plus hours just to go on it. We were lucky enough to hoof it down Main Street that first day and get in line in time to be on the first round of subs going out. By the time we got off the ride, the line was almost two hours long. At 7:30 in the morning. 5. If you're *not* going to wait hours for Finding Nemo, you'll love mornings. All the other rides are easier to get on, because everyone else is waiting in line for FN. We walked on Space Mountain, Star Tours, Big Thunder Mountain Railroad, and Splash Mountain -- all within the first two and a half hours of the day our first day there. 6. My almost-four-year-old is an adrenaline junky. We were a little nervous about taking the kid on some of the faster rides -- would they be too much? Ha! No fear. Hands in the air, all the way. Even on the big drop on Splash Mountain. 7. My husband couldn't talk me into trying the Maliboomer (shoots you straight up in the air 200 ft, then drops you back down), but my eight year old managed to convince me. 8. Don't miss Aladdin. Broadway-quality show in under an hour. And if you can swing it, try to get a seat in the mezzanine or balcony. Some of the special effects are amazing from there. 9. The food is insanely overpriced, though to be fair you'd get pretty decent portions. Our older two wore fanny packs they got to stock themselves from a box of snacks I'd put together before vacation. Note: goldfish crackers do not travel well. Stick to cereal bars, fruit snacks/fruit leather, rice krispy bars -- things that either hold their shape or it doesn't matter if they get a little squished. Water bottles are also a good addition, though if they don't have dedicated pouches on the fanny pack, they're liable to fall off. 10. California Adventure is not as much fun for shorter people. My youngest missed out on several of the rides because of height restrictions. Some rides/events that worked for the whole family -- Turtle Talk with Crush, Aladdin, Monsters Inc, Muppets, Soarin' Over California, the Electrical Parade. 11. The California/Oregon coast has some of the most spectacular scenery I've ever experienced. If you're not in a hurry to get anywhere, hop off the Interstate and take 1 or 101 all the way up. But be warned -- it'll take you three times as long to get where you're going, and if anyone in the car tends to get motion sickness, spring for some Dramamine. All those twisty coast drives made me a little woozy. 12. Do not -- I repeat, do NOT -- attempt to drop in on a town on the coast expecting to find a hotel room. On a Saturday. In the summer. Make reservations in advance. And don't expect to call from the road to find a place to stay. If you're taking the coast highway, you won't have cell coverage for a good portion of the drive. 13. I am physically unable to work on the computer in the car. At least, for anything requiring me to read what I'm working on. Writing totally new material without worrying about typos? Possible. Revising or editing? Fuggedaboutit. Congrats to Stacy~, who won my Disneyland blog contest. Thanks for commenting on my blog while I was gone, Stacy~! Stacy~, please contact me off-blog at kate AT kate-davies DOT com with your address and I'll pop it in the mail to you. Congrats again! Oh, and if anyone else wants a chance at another Disney souvenir, be sure you're signed up for my newsletter. One member will win a pair of Mickey Mouse earrings this month. The Unofficial Guide to Disneyland, 2007 Edition! (Of course, if/when you go, be sure to get the most updated version.) This book is full of tips and tricks to help make your visit to Disneyland as smooth and worry-free as possible. We didn't use the suggested maps (three kidlets were FAR too opinionated to make that work! ), but there were lots of ideas that helped make our trip the best vacation ever. I'll be posting more this week, including the winner of my giveaway, so be sure to stop by! Yes, I'm almost out the door, but before I head on down the road to The Happiest Place on Earth (tm), I wanted to make one last post. I won't be blogging from vacation, mostly because our hotel has a business center instead of in-room WiFi and I don't know the hours yet, so this will be my last post until Monday July 16. But instead of leaving the blog totally dark until then, I thought I'd pass the responsibility on to you. Here's the deal -- stop by once in a while and post a quick message. Have you read a great book recently? Seen a good movie? Have news to share? Post it in the comments so I'm not totally out of the loop when I get back. Then, on my return, I'll pick one poster at random to win a guaranteed authentic Disney souvenir! See you in a week or so -- and good luck!